We've had sooo much rain lately. It brings out many mushrooms, and the little Red Efts, in our woods. This Eft crawled out from under a fallen mushroom. Painted with Topaz and modified in Photoshop. I found it amusing in a miniature world. Please click on this for better color, etc. What a unique find, Cindy. 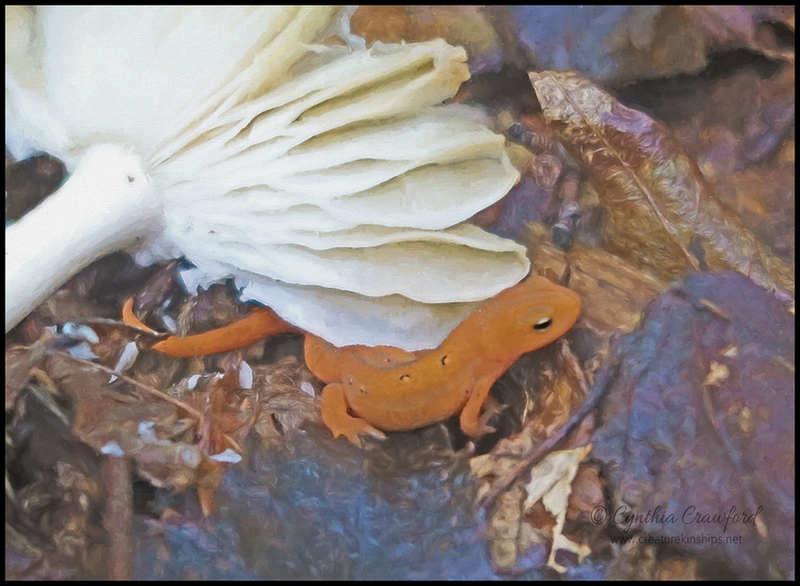 Was the Eft seeking shelter under the mushroom, or the subject of an unfortunate accident? There is a lovely contrast between the colors of the mushroom and Eft, and the textures you have added are beautiful. Well done! Thanks-no harm done to the Eft-it was just wandering around. The mushroom was feather light, and Efts are tough little critters. I think they are made of rubber! Glad it is ok, I thought that the mushroom may have fallen on it. A great scene in the miniature world. My first time to see an Eft, so thanks for sharing, Cindy.